Cordell Bank was originally created 93 million years ago as part of the southern Sierra Nevada mountains. 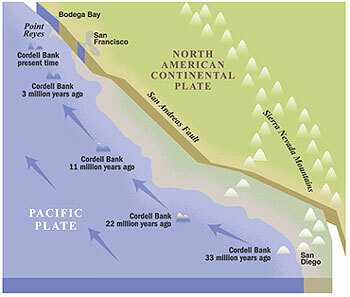 As the Pacific Plate moved north, it sheared off part of the North American plate and carried Cordell Bank to its present location west of Point Reyes. The Bank continues to move north at a rate of about three centimeters per year. Between 20,000 and 15,000 years ago when sea level was about 360 feet below current sea level, most of Cordell Bank was exposed, making it a true island. Today Cordell Bank emerges from the soft sediments of the continental shelf deposited more recently by coastal erosion. Within seven miles of the bank's western edge, the seafloor drops to over a mile deep.